Definition at line 3277 of file winuser.h. Definition at line 3278 of file winuser.h. Referenced by MessageBoxExW(), MessageBoxIndirectA(), MessageBoxRes(), MessageBoxTimeoutA(), and MessageBoxTimeoutW(). Definition at line 3285 of file winuser.h. Referenced by MessageBoxExW(), MessageBoxIndirectA(), MessageBoxTimeoutA(), and MessageBoxTimeoutW(). Definition at line 3287 of file winuser.h. Definition at line 3283 of file winuser.h. Referenced by MessageBoxExW(), MessageBoxIndirectA(), MessageBoxRes(), MessageBoxTimeoutA(), MessageBoxTimeoutW(), and SoftModalMessageBox(). Definition at line 3280 of file winuser.h. Definition at line 3279 of file winuser.h. Definition at line 3286 of file winuser.h. Referenced by MessageBoxExW(), MessageBoxIndirectA(), MessageBoxProc(), MessageBoxTimeoutA(), and MessageBoxTimeoutW(). Definition at line 3282 of file winuser.h. 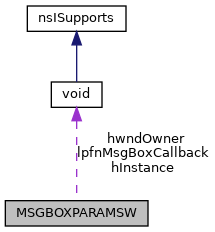 Referenced by MessageBoxExW(), MessageBoxIndirectA(), MessageBoxRes(), MessageBoxTimeoutA(), MessageBoxTimeoutIndirectW(), MessageBoxTimeoutW(), and SoftModalMessageBox(). Definition at line 3284 of file winuser.h. Referenced by MessageBoxExW(), MessageBoxIndirectA(), MessageBoxTimeoutA(), MessageBoxTimeoutW(), and SoftModalMessageBox(). Definition at line 3281 of file winuser.h.